In East Harlem, so far East, on a street I never knew existed (Pleasant Avenue), I almost missed the door with the humble paper sign scotch taped on: The Nourishing Kitchen of NYC 281 Pleasant Avenue, New York, NY 10029. A class is underway, about 6 seniors from the nearby senior center are learning how to make a healthy pizza on whole wheat pita. 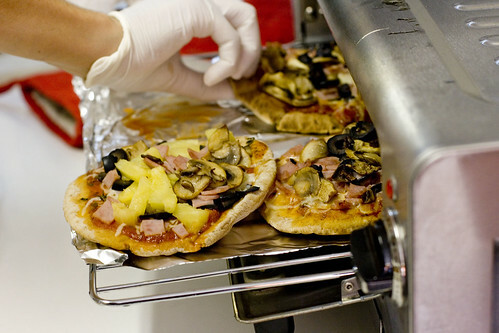 Chef Gina Puzzanghera is sputtering off the benefits of whole wheat over white, encouraging the use of mushrooms, and reminding them about low-fat cheese. 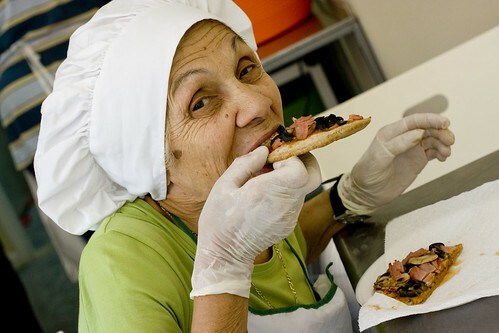 As the class loads up their pizzas with olives, pineapple, ham, and more, Gina pulls out another package of whole wheat pitas and tells them where they can get this nice stack for 99 cents in their neighborhood. She gives them each a pack to take home anyway. A late-comer arrives and Gina asks the class to fill her in on what they learned. To my complete amazement, most of the highlights were regurgitated. Gina’s message was sticking and I realized that this was not your average soup kitchen. 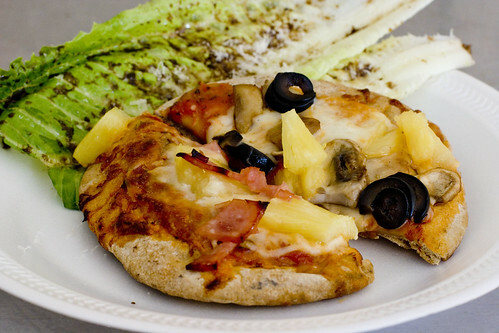 As the pizzas bake, Gina starts showing the class that simple romaine with balsamic vinegar, olive oil, and some parmesan is healthy, easy, and delicious. As the class enjoys their lunch, pridefully describing the pizzas they’ve made, a women walks in and Gina offers her lunch. She encourages her to sit down. She’s got plenty of extras. When the class is done and the place is empty, Gina starts shooting off stats rapidly, mostly about the alarming rate of obesity and diabetes in Harlem. There is so much misunderstanding, like washing rice makes it not a carbohydrate anymore. She gives senior classes monthly, has a soup kitchen on Wednesdays, had a teen class in the summer, and partners with several hospitals and local organizations to teach about nutrition and nutritional cooking. (There’s more.) Another women walks in, gives Gina a hug, and hands her a stack of magazine tear-outs, all about food, things she thought Gina would be interested in. It was the sweetest thing I had ever seen, a women who had no funds to show her gratitude with, but wanted Gina to know how much she appreciated her. When it’s empty again, I sit down to eat with Gina and Ari. 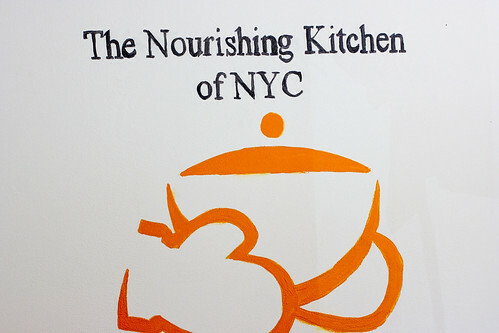 (Ari is the grant writer that was assigned to The Nourishing Kitchen 2 to 3 months ago.) They are optimistic about getting more grants now but being a non-denominational soup kitchen makes it difficult when most of the funding is for churches. Some grants are only offered after you reach your three year mark but this operation has been running for about a year now and Gina has maxed out all her credit cards. I looked at her in disbelief. She has been paying for most of this herself, feeding anyone who needed food, and making sure it was healthy. They get some donations but they need more, a lot more. As I try to learn about her, I find out she went to culinary school on a James Beard scholarship, then got her Masters in nutrition at New York University, and also worked in fine dining. She’s highly qualified but I started asking if she had a family history of diabetes. I needed to know why this 20-something year old chef, who should be out partying, would put herself in debt starting a not-for-profit organization. (Take a breath.) Gina was homeless as a child, having slept in cars and funeral homes. She didn’t go into it more beyond that and I couldn’t ask anymore. I was fighting back tears so I started talking about something else. 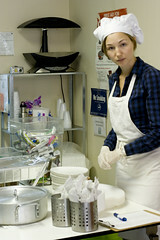 I went back yesterday to see their soup kitchen, happy to see several volunteers, many who come regularly. I spoke to a nurse, a nutritionist, and a women with a culinary/agricultural background, all who felt strongly about this soup kitchen and the unique mission. As some served, some cleaned, some delivered food to the elderly or disabled. With extra volunteers, they were able to give out fliers. In between directing, Gina tells me about their Thanksgiving plans, her upcoming vocational training for disabled women, and her goal of expanding to all five boroughs. A regular walks in and Gina snaps back into her mode. She warns him that she saw him in the supermarket purchasing a large bag of sugar. She shakes her head and tells him she’s watching him. I stand humbled, inspired, and in awe of all the hats Gina Puzzanghera wears each day: chef, nutritionist, founder/manager/director. She’s also the one to go to if you need a hug. posted by jessica	at 02:25 PM	Filed under Miscellaneous. You can follow any responses to this entry through the RSS 2.0 feed. Both comments and pings are currently closed. Such an inspiring story. Thanks for posting. wow, what a wonderful woman. I fought back tears just reading this. It’s always a pleasure to volunteer there every Wednesday. Now *this* is the cooking that inspires me. Absolutely wonderful. Amazing girl Gina. Not just anyone whould go threw the things she must have to to get nothing in return. Gina sounds like such an incredible person, a very inspirational story! Wow, this is a truly inspiring story. Gina sounds wonderful and extremely compassionate- a first class person. I would love the opportunity to participate in, or start something like this. Thanks so much for posting this amazing story. 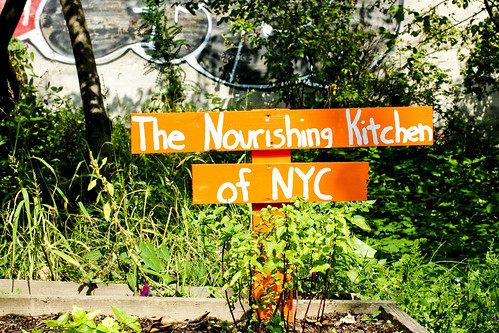 Nice tribute and what is it about that word “nourishing” that sounds better than healthy. Gina u left me in tears…u know what doing any job can never give this much of satisfaction on everyday basis to someone who is spiritual, sensitive and belives in giving. Working for yourself is like protecting your identity everyday and working for others is like spreading your identity to loose its limits. I just started reading food blogs to see what all the buzz was about. I’ve been in the culinary field for 15 years, and a chef-instuctor for 8 of it, but that was well before it was necessary to keep up to date with online media. It was tough to gear up to, but this was the first blog I started reading and this article (even though it was posted months ago) was exactly the information I was looking for; something I might not have found on my own. This woman is doing what I wish I could do, but I am so happy to have found her and to be able to support her so she can continue to do her unbelievable work. 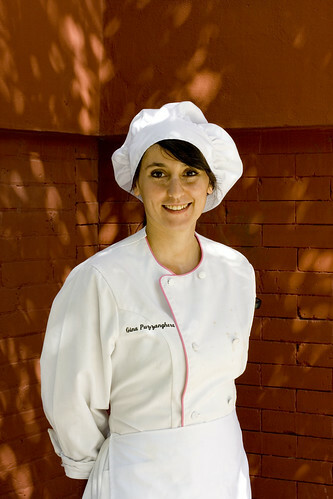 Jennifer Clair, founder of Home Cooking New York. Hi Jennifer, believe it or not, I had a tough time adopting to online media. I didn’t do anything besides e-mail before I met my husband. He started this blog and then eventually, I fell in love with blogging and then took it over. I hope you’ve started enjoying blogs more since you started. I really appreciate that you read my blog, and I love to spread the word about people like Gina. She is truly inspirational and a true angel. Yes, I will read for sure. Easier to start with one…it is trying to keep up with all of them that is daunting. Full disclosure: You are now on my email list and I am just about to send out a press release about the new cooking school I opened in Manhattan…a first for us. I stumbled on your site when my PR person send me a media list of food blogs to send it to. yours seems to have the down-to-earth info that i am actually looking for, so I signed up myself! I look forward to my updates! And I am calling Gina today to see how I can get involved. Very interesting story. Love to know more. Louisa, you can go to their website, eatwellnyc.org and contact them to learn more. I am linking this webpage from my private blog . this has all the usefull data necessary.